If I were to list the top three interview questions we are asked by the press (and just about anyone else) they would be "What is your favorite country? ", "What is your budget? ", and "How do you decide where to go next?" If you click on the More Media tab on our website you'll see we've answered those questions many times, in many languages - but to be honest, the answers aren't always easy. Especially the first two - one, because declaring a favorite country is a moving target. We've loved many different places for some very different reasons - although when pressed, our answer turns out to be......Croatia. The second one is challenging because we don't want to discourage potential nomads by sharing numbers that might seem out of reach - even though we travel frugally. We do share our average Airbnb budget of $90 per night, but all of the expenses can be scaled up or down depending on the level of comfort required, how often a person travels from place to place, the form of transportation, and the cost of living in a particular country. One of our best decisions was to travel with our trusty bed pillows - a little piece of home. As for the third question, How do we decide where to go next? We ask ourselves that very same thing all the time! When we left Seattle four years ago this week, we bought round-trip tickets from Seattle to Paris for a six month trial run. If we didn't like our new lifestyle, we'd pick up where we left off back home. We knew we'd concentrate our initial travels in Europe, familiar territory to us, so we charted a course that took us to our favorite counties and added a few new ones. We returned to Seattle for Christmas as planned, and by New Year's Day, we'd bought tickets to return to Europe. We were excited to continue our lives as Senior Nomads and seek new and further destinations. So, where to this time? This was the start of choosing places that fit a criteria. Michael follows current events like he was managing the international news desk at CNN - he particularly keen on politics and sports. I am interested in the food and culture of the places we visit, especially graphic design and urban planning. So together we decided to learn more about post WWII Europe as well as the rise and fall of the Soviet Union. There would be plenty to keep us busy for the next year! And, as it turns out, well beyond. We've visited 67 countries and 200 cities to date, and are about to mark our 1,000 night spent in an Airbnb. WE'D LIKE TO OFFER YOU A $40 CREDIT ON YOUR FIRST AIRBNB! CLICK HERE. Our itineraries have taken us to the far reaches of Eastern Europe, Russia, Turkey, Israel, The Balkans, The Baltics, The Caucasus, The Middle East, Africa, Cuba, and just recently Central Asia to visit Kazakhstan and Kyrgystan. Keeping track of our flight from Dubai to Almaty, Kazakhstan. Where? You may already know this, but on the Senior Nomad "org chart" Michael is our Chief Travel Planner. He does the research, books the transport, organizes the paperwork, and keeps our phones and electronics up and running. He is also CFO and minds the budget and pays the bills, skills he honed as a professional sports events promoter. Often he will have multiple spread sheets open, and, armed with a Diet Coke and a few cookies seems to truly enjoy the challenges of making this little enterprise work. Doing a little travel planning before we left last February for Africa and "the Stans"
My titles include Chief Provisioner, Entertainment Director and Cook. That means I am looking ahead for places where there might be a football match, a particular historical site, or something "newsworthy" taking place. Last year we spent two weeks in London because we wanted to watch the run-up to the Brexit vote and it's aftermath. And we visited Amsterdam, for the 3rd time, so Michael could attend the 2016 European Athletics Championships. Airbnb Experiences are an interesting way to see "behind the scenes" of a city. Here we are on a tour of street art in Paris that ended with time in the studio of the famous artist Mr. Pee. Michael has attended at least two dozen football matches around the world. Stocking up on pineapple in Zanzibar at four for a dollar! We make our best decisions on destinations as a team, with each of us having a say in where and why we want to stick a pin in the map. This isn't always a smooth process. I like my travel to include fresh markets, art museums, historical sights and good coffee. Michael's needs for creature comforts are fewer, and he puts his pin in places that are often in the news or off the beaten track. For example, we were finishing up our time in Africa and wanted to visit The Middle East. Several of those countries come with specific warnings from The US State Department that American citizens should avoid them. Take Iran - Michael was very keen to go there. I was reluctant, but willing since it suppose to be an amazing country until I scanned the warnings. They included some ominous lines like "have your affairs in order" and "have a ransom plan in place" before you go, because, apparently our government would not be able to help us if we ran into trouble there because we do not have an embassy there. Personally, I don't think terrorists have any use for the likes of us - but I'd like to see my grandchildren again, so we compromised and spent time in Beirut, Lebanon (a place we both loved) Amman, Jordan and Dubai in UAE. Luckily, we've already spent time in Turkey, Israel and Qatar - places we would probably avoid in the current climate. We are also glad we had three weeks in Cuba last year since Mr. Trump seems to be eager to make it harder, not easier, to visit. Michael talking politics with Evilio, one of our hosts in Cuba. That all adds up to some serious travel planning! For those interested in the logistics, it goes like something like this. Ideally, we try and have our plans in place 6 to 8 weeks ahead. That doesn't always work, and as I write this we don't have a place to stay just two weeks from now! But that's an exception - mostly because we are in Stuttgart, Germany and there are more ways to travel around Europe, and more Airbnbs to choose from than, say in Kyrgyzstan. Our average stay in each city is 7-10 days. Here's an Airbnb in Fishhoek, South Africa we were very sad to leave. There is also some method to all this madness. We try and sequence our travel so we are not zig-zagging across continents, and we spend time in more affordable countries like Armenia and Belarus to make up for budget-busters like Norway and Switzerland. Michael uses two apps that are critical to our planning - Rome2Rio and Skyscanner. Rome2Rio serves up all you need to know to get from one city to the next anywhere in the world! Options include trains, planes, ferry boats, buses, autos (including ride-sharing), along with current schedules and estimated costs. Skyscanner is just one of many flight sites but it is Michael's favorite. More than once we've used the feature where you type a city in the FROM: field and "everywhere" in the TO: field and it will entice you with flights by ascending price to dozens of destinations around the world. It's how we ended up in Athens and Jerusalem without much planning because the flights were so cheap! We've used many different forms of transportation, but this was a first (and I mean that for Michael). 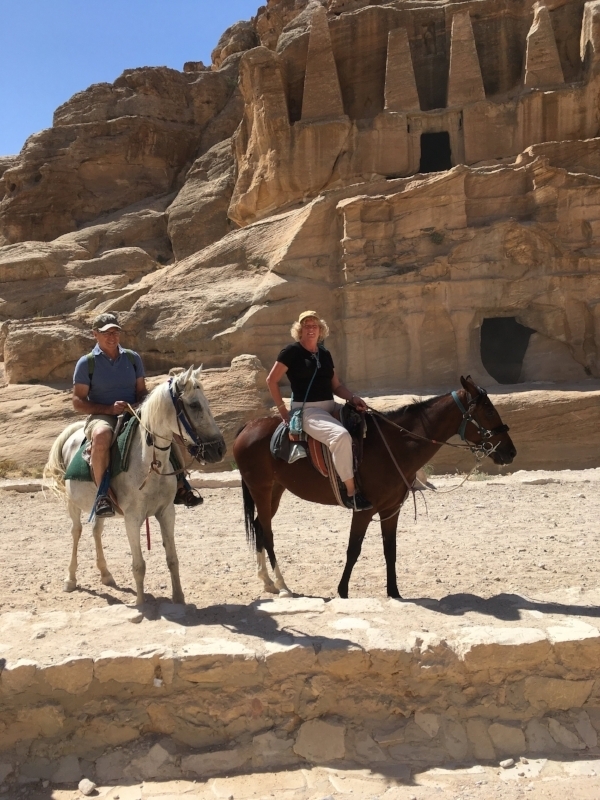 On horseback in Petra, Jordan. And of course, we have a system down for finding our next Airbnb "home". I dedicated two chapters to the process in our book Your Keys, Our Home but the basic criteria includes finding an entire house with a decent kitchen, wireless internet, a big table where we can work, eat and play games, a washing machine, and a location close to the center of the city so we can use public transportation and reach our goal of walking 10,000+ steps day. For research on destinations Michael loves the World Fact Book which can be found online. It is a comprehensive look at statistics for every country in the world put together by the US Government. Well actually by the CIA :) We both use Wikitravel, Lonely Planet, and TripAvisor as a guides. It's also fun to look at expat sites for a city to get some insider tips on how to really "live" somewhere. Here's an example for Munich. One way to save money is to take flights at odd hours - usually in the middle of the night. So that makes ice-cream for breakfast at the airport in Jeddah, Saudi Arabia seem normal. I guess the fourth question we are asked most often is "How long will you keep doing this?" And I know most of you know the answer. "As long as we are learning something everyday, having fun, staying close to budget, and still in love". So far so good, so that means we will be scouring our world map for places in the news for a while longer. Did I mention Michael is also Head Sherpa? Have bags will travel - wherever that might be! We are currently in Stuttgart, Germany, looking forward to some less challenging travel. We will work our way through Germany, Austria and Switzerland and at least have lunch in Liechtenstein so we can cross it off the list as the only country in Europe we haven't visited. Finally, we will reach France for a two-week visit with Mary and Gregoire and three of our five grandchildren in their new home in Samois Sur Seine. Now there's something worth planning for!